The use of plastic mulch (PM) is common for warm-season vegetable production in the North Central Region. 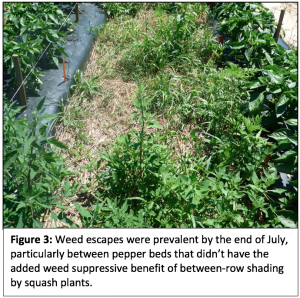 While PM offers excellent weed control in-row, weed management in the between bed area (referred to as “inter- bed” hereafter) remains a challenge. For organic growers particularly, weedy inter-beds can be a problem because organic herbicides are expensive and ineffective. As an alternative, organic farmers employ a variety of strategies to manage this area including cultivation, mowing weeds, dead mulches, and less commonly, living mulches (cover crops). Leaving the inter-bed ground bare, as in cultivation, leaves the soil highly susceptible to erosion and nutrient leaching due to aggressive runoff induced by the impervious surface of PM. Alternatives that keep the soil covered are of great interest to growers. The objective of this study is to obtain a systems-level understanding of a range of inter-bed weed management practices as they relate to weed suppression, nitrogen retention, soil health as indicated by microbial biomass and functional diversity, crop yield and quality, labor requirements, and production cost. A two-year organic field trial (2017-2018) will be established at a research farm in southwest Michigan to evaluate both in season and cumulative impacts of inter-bed management strategies. Treatments will include a cultivated control, mowed weeds, rye/vetch dead mulch, rye living mulch, rye/white clover living mulch, and annual ryegrass living mulch. These management strategies are representative of current practices (cultivation, mowing, dead mulching) and living mulch treatments that are less commonly used but of great interest to growers. On-farm demonstrations will also be established with grower collaborators in the second year of this study to gain a better understanding of the management challenges and benefits farmers experience when implementing alternatives to cultivation for weed and soil management in PM systems. Results will be communicated to scientific and farmer communities through publications in peer-reviewed journals and online extension outlets, and through presentations at scientific and grower conferences. Outcomes will include a better understanding among vegetable growers of the impacts of inter-bed management strategies on crop, soil, and environmental health leading to the adoption of management practices that ensure farm and environmental sustainability. The goal of this project is to evaluate the systems-level effects of different between-bed management strategies for vegetables grown on PM. The results from this study will provide detailed information regarding the functioning of individual parts and the system as a whole which will help farmers make informed inter-bed management decisions in PM systems to improve crop production, soil health, and environmental sustainability. Vegetable farmers will have a greater awareness of alternatives to cultivation for weed and soil management between PM beds. Vegetable farmers, extension educators, and researchers will have a better understanding of how different inter- bed management practices in PM production influence system-level functioning. Vegetable farmers will be empowered to try alternative inter-bed management strategies and evaluate them in the context of their specific production system. Vegetable farmers will make weed management decisions between PM beds which will improve soil health and reduce nutrient leaching. Researchers and extension educators will make well-rounded recommendations regarding inter-bed weed management in PM systems. Vegetable farmers will have the potential of greater profits as a result of reduced weeding costs, improved fruit quality, greater nutrient retention, and preservation and building of healthy soils. Environmental sustainability will be achieved through potential reductions in nutrient leaching and soil runoff. Field Description. In May 2017 a field experiment comparing different inter-bed management strategies was conducted at the Southwest Michigan Research and Education Center in Benton Harbor Michigan (42°N, 86°W). The soil at this site is a loamy sand. The area used for this experiment is a transitioning organic field that had been maintained as a rye/hairy vetch fallow for five years prior to the implementation of this experiment. This study was conducted using a randomized complete block design with four replications (Fig. 1). Individual plots measured 6.1-m long and 5.0-m wide. Each plot contained two pepper beds and two squash beds. One bed of each crop functioned as guard rows to eliminate edge effects (Fig. 2). In-bed soil data and harvest data measurements were taken only on the two middle beds. Inter-bed data was collected from the three inter-bed areas per plot. Six inter-bed management strategies were evaluated in this study. These strategies include bare ground, dead mulch, mowed weeds, rye living mulch, Italian ryegrass living mulch, and a rye/Dutch white clover mixture living mulch. Rye and hair vetch cover was flail mowed and incorporated using a rototiller one week before plastic mulch was laid. Immediately before plastic mulch bed establishment, individual plots received 100lbsN/A 10-2-8 (N-P-K). Fertilizer used was OMRI approved Nature Safe (Irving, TX) All-Season Fertilizer. Plastic mulch beds were was laid on 1.7-m centers. 1-mil embossed plastic was used, measuring 1.2-m wide. Beds were raised to 15-cm and the tops of beds measured 1-m wide. Single 16-mm-diameter drip lines with 30-cm emitter spacing, each with an output of 9.5 ml min-1 were installed under plastic at the time of bed establishment. Bell peppers (Capsicum annuum cv. Paladin) were started in a heated greenhouse eight weeks prior to planting. On May 17, 2017 bell pepper (Capsicum annuum cv. Paladin) were hand transplanted and yellow summer squash (Cucurbita pepo cv. Lioness) direct seeded into polyethylene plastic mulch, one week after plastic mulch had been laid. Peppers were planted in two rows per bed at 46-cm (18-inches) in-row and 61-cm (24-inches) between-row spacing. Squash was planted in single rows at 61-cm in-row spacing. To mitigate any germination challenges, squash seeds were planted 3 seeds/hole. If more than one seed germinated, the shortest of the seedlings were removed, leaving a single plant. Irrigation was run for 20min 2x daily from planting to July 25. After July 25 the rate was increased to 30min 3x daily. Squash harvesting began on July 7, 2017 (37 days after planting) and continued for 3.5 weeks. Squash was harvested every-other-day throughout the harvesting period and separated into marketable fruit and culls according to USDA standards. Pepper harvesting began on July 28, 2017 (58 days after transplanting) and continued for 5 weeks. Peppers were harvested weekly and separated into marketable fruit and culls according to USDA standards. Inter-bed management treatments were established at the same time as cash crop planting (May 31, 2017). All inter-beds were shallowly cultivated using wheel hoes before inter-bed management establishment to allow for living mulches to be planted into stale seedbeds. Living mulches were dropped seeded between plastic mulch beds and incorporated into the soil by raking. Rye, Italian ryegrass, and rye/Dutch white clover living mulches were planted at 150lbs/acre, 30lbs/acre, and 75,20lbs/acre respectively. Dead mulch was a rye/vetch straw applied by hand at a desired rate of 8,000lbs/A. Equal distribution of dead mulch between the three inter-bed areas was accomplished by visual estimates. Data Collection. 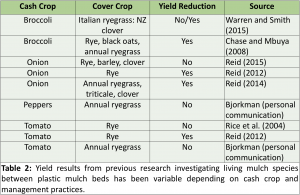 Effects of each inter-bed management strategy on inter-bed weed pressure, crop yield, in-bed soil moisture, and inter-bed soil microbial biomass and nitrogen dynamics were measured to broadly characterized each management strategy. Inter-bed weed pressure was evaluated before each mowing event and at the end of the season for a total of four data collection dates. 0.625-m2 quadrats were randomly established in each inter-bed area at the beginning of the season, and samples were collected from this permanent quadrat over the season. 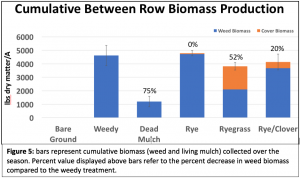 Weed and living cover biomass was collected above the mowing height for the first three collection dates and to the ground at trial termination. Weeds and living covers were separated, and weeds separated further into grass and broadleaf species and quackgrass. Quackgrass was separated from other weedy grass species because of its heterogeneous spread in the field. Samples were dried to constant weight before weighing. After each harvesting event, harvested fruit were sorted into quality categories. Since squash quality is mostly dependent on the individual markets, USDA standards for summer squash are vague and quantitative definitions unavailable. Thus we separated squash fruit into “small” “medium” “large” “oversized” and “cull” categories. Small fruits were those measuring under 5.5 inches, medium fruits measured between 5.5-7.5 inches, large fruits measured between 7.6-9 and oversized fruits were anything over 9 inches. Culls where fruits with defeats or damage that would make them unmarketable. Pepper fruit were separated into the quality categories defined by USDA which included “fancy”, “no. 1” “no. 2” and “cull” categories. Fancy fruit were those measuring at least 3” in diameter and 3.5” in length. No. 1 fruit were those measuring between 2.5-2.9” in diameter and 2.5-3.4” in length. No. 2 fruits were those measuring less than 2.5” in diameter and 2.5” in length, but with no obvious defeats or damaged. Defected or damaged fruits were labeled culls. In-bed soil moisture was monitored throughout the season using a Spectrum Technologies FieldScout TDR 300 with 20-cm rods (Aurora, IL) . 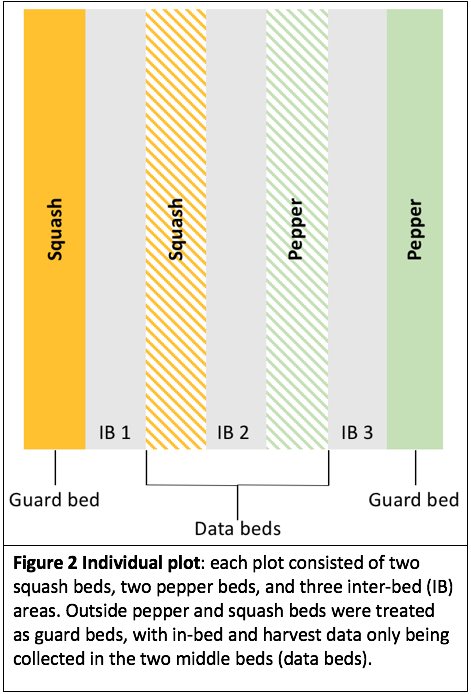 10 measurements/bed were averaged separately in squash and pepper data beds at each collection time. Squash and pepper leaf samples were taken at the last harvest event. 12 leaves/plot were collected in squash beds and 20 leaves/plot in pepper beds. Samples were dried to constant weight, ground and sent to A&L Great Lakes Laboratories (Fort Wayne, IN) for nutrient analysis. Inter-bed soil samples for microbial biomass and extracellular enzyme activity were collected at monthly intervals throughout the season starting at cash crop planting and inter-bed management establishment. These four dates were May 31, June 27, July 25, and August 24. Inter-bed soil samples used in analysis were composites of four cores collected to a depth of 20-cm from each of the three inter-bed areas. Immediately following collection, soils were kept in a cooler in the field and during transport and stored at 4C before analysis. Microbial biomass was determined using the fumigation-extraction method within a week of soil sample collection (Robertson et al. 1999). Sample extracts were kept frozen at -20C before being sent to Michael Weintraub’s Ecosystem and Soil Ecology Laboratory at the University of Toledo (Toledo, OH) for total carbon and nitrogen analysis. Soils for extracellular enzyme activity were frozen at -80C for 24 hours, then transferred to -20C for long term storage. Soils were kept frozen until analysis. We measured the activities of two cellulases (-1,4-glucosidase (BG), cellobiohydrolase (CBH)), a chitinase (-1-2-N-acetylglucosaminidase (NAG)), a pepitase (leucine amino hydrolase (LAP)), an enzyme responsible for releasing phosphorus from soil organic matter (phosphate-monoester phosphohydrolase (PHOS)), and urease, phenol oxidase, and peroxidase activity. Urease, phenol oxidase, and peroxidase were measured using colormetric assays, all other enzymes were measured fluorometrically with corresponding methylumbelliferone (MUB) or methyl coumarin (MC) labeled substrates added to soil slurries in 96-well microplates as described by Saiya-Cork et al. (2002). One soil core/plot was collected in inter-bed areas in September 2017 before plastic mulch removal and winter cover crop planting. Cores were sampled in the middle inter-bed area that was flanked by a pepper and squash bed. Compaction in some areas caused us to deviate from this sampling methodology in three plots. In these cases, cores were taken from the inter-bed area that had the most living mulch soil coverage, as these were all living mulch plots. Cores were taken down to at least 60-cm using a gas powered core sampling kit from AMS Inc. (American Falls, ID). Cores were separated in to 20-cm sections before inorganic N analysis. Robertson, P.G., D.C. Coleman, C.S. Bledsoe, and P. Sollins. (1999). Standard Soil Methods for Long-Term Ecological Research. New York, NY: Oxford University Press. Saiya-Cork, K.R., R.L Sinabaugh, and D.R. Zak. 2002. The effects of long term nitrogen deposition on extracellular enzyme activity in an Acer saccharum forest soil. Soil Biology and Biochemistry. 34: 1309-1315. We hypothesized that plastic mulch would act as a barrier to competition between cash crops and living mulch. 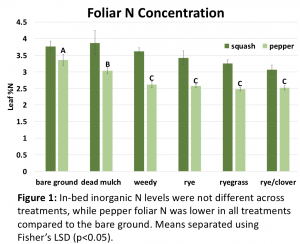 Our results only partially conferred our hypothesis, as squash preformed equally well in all treatments, but pepper yields were reduced in all treatments compared to the bare ground control (Table 1). 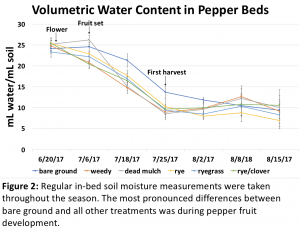 Pepper yields were reduced the most in Italian ryegrass plots, with a 45.6% reduction in total harvested fruit weight, and a 54.5% reduction in marketable fruit weight. a high C:N ratio, perhaps resulting in vetch residue broking down quickly and reducing our 8000lbs/A target rate. management practice adjustments. While our irrigation and fertility regimes were appropriate for maintaining squash yields, they need to be reconsidered for pepper. Perhaps adding fertility or increasing irrigation rates would mitigated competition between living mulch and peppers. Additionally, delaying living mulch planting might have given pepper a competitive advantage. In the coming season, we will be adjusting our irrigation schedule and fertility management in an effort to mitigate competition issues. problematic as their shoots began to overtop plastic mulch beds by mid-July. 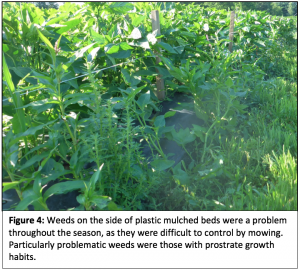 Additionally, weeds and living mulch on the edges of plastic mulch beds were difficult to manage with our mowing strategy (Fig 4). established well, it did not perform its desired function in this situation. As expected, clover was slow to grow, and did not provide much early season weed suppression, though did lead to a 20% reduction in cumulative weed biomass. No significant differences in soil microbial biomass were observed between treatments at the end of the season. Samples for analysis were taken at the end of August before living mulch or dead mulch incorporation. It is likely that differences would have been seen if samples were collected after incorporation of organic materials. In the coming season, we will include a fifth sampling date to capture any microbial biomass differences after residue incorporation. Possible shifts in microbial community structure are continuing to be evaluated via extracellular soil enzymes. cover in these treatments. Even with weed escapes later in the season in dead mulch, potentially leachable nitrogen at the end of the season was more similar to bare ground plots compared to living mulch and weedy treatments. This is likely explained by the patchiness of plant distribution in dead mulch plots. Another explanation is nitrogen could have been leached earlier in the season and was unavailable to weed escape root systems later in the season. 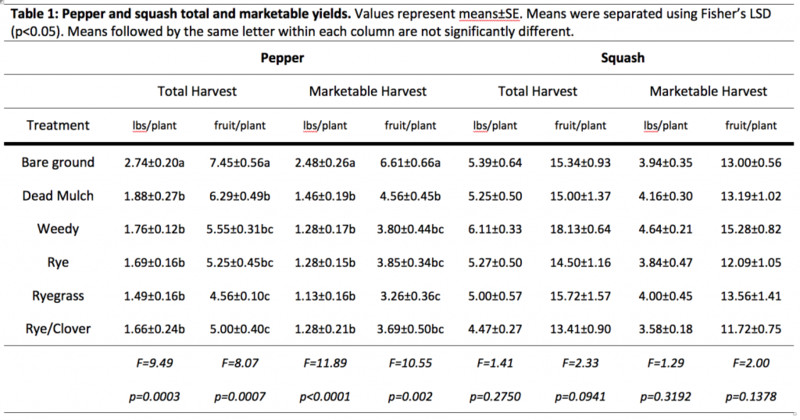 Differences in yields between pepper and squash crops in this trial, and yield variability in previous work, clearly demonstrates the importance of proper cover crop selection and adjusting management practices for different cash crops in living mulch systems. Our strategy for mitigating pepper yield losses in living mulch and weedy treatments this coming year will be to revisit our fertility and irrigation strategies and adjust appropriately. This will increase management costs, which for some growers might not be an acceptable tradeoff. An alternative strategy that could be attractive to a grower might be to manage inter-bed areas as bare ground while pepper establishes and then plant living mulch for later season soil coverage. Weed suppression was greatest in dead mulch treatments compared to all living mulch plots. Within living mulch treatments, Italian ryegrass showed greater weed suppressive ability than rye or rye/Dutch white clover mixture. While we did not see any weed suppression with rye in our trial, this was not the case for a farmer collaborator who planted rye living mulch a month earlier than we did. Rye on his farm was planted at the beginning of May between plastic mulched early season greens. Although the seeding rate was unknown, and weed suppression was not measured quantitatively, the farmer was thrilled with the level of visible weed suppression by rye. The grower’s primary goal was to alleviate water erosion problems he experienced on a sloped area of his field (Fig. 7). Weed suppression was a much welcomed secondary benefit. Soil microbial biomass was not influenced by the treatments included in this study. Though it should be noted that a measurement was not taken at residue incorporation when differences between treatments would be most likely. Investigations into microbial community shifts over the first season is ongoing. Additionally, we plan to put this trial on the same field, with treatments in the same areas, to study the cumulative impacts of different management strategies on soil microbial communities. Potentially leachable nitrogen in inter-bed areas was reduced in all plots where roots were growing throughout the season. The purpose of including a mowed weedy treatment was to evaluate the potential of mowed weeds to deliver some of the same agroecosystems services we were anticipating living mulches to provide. 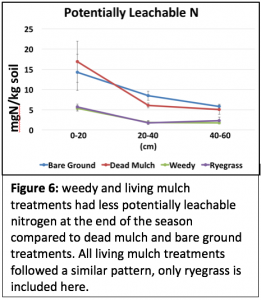 As far as reducing potentially leachable nitrogen at the end of the season, weedy treatments performed just as well as our living mulch treatments. We have learned a lot in our first field season that will help guide the second year of this research. Firstly, given the evidence of pepper yield reductions being attributed to water and nitrogen competition, fertility and irrigation will be more closely monitored. Secondly, bare ground strips will be maintained along the edges of plastic mulch beds to increase the ease of mowing and potentially mitigate competition issues. In spring 2017 we offered cover crop seed to growers interested in establishing living mulch between plastic mulch beds. Most feedback was positive, with one grower interested in converting the entirety of his plastic mulch operation into a hybrid mulching system with living mulch between plastic mulch beds. Expansions of grower collaborations will be implemented this coming growing season, as we plan to establish two on-farm demonstrations. These demonstrations will not only give growers the opportunity to see their neighbors trying innovative cover cropping strategies, but will give researchers important insight into the challenges and successes experienced by production farms implementing living mulch strategies. Chase, C.A. and O.S. Mbuya. 2008. Greater interference from living mulches than weeds in organic broccoli production. Weed Technology 22. 2:280-285. Reid J. and K. Klotzbach. 2012. Spring application of winter rye grain for weed control in summer vegetables. web: cvp.cce.cornell.edu. Reid J, A. Ivy, M. Davis, and S. Reiners. 2014. Inter-row cover crops for plasticulture vegetables. Northern NY Agricultural Development Program. Reid, J., E. Buck, N. Hoover, and E. Stoltzfus. 2015. Advancing living mulch in plasticulture vegetables. SARE ONE14-221. College Park, MD: University of Maryland. Rice P.J., L.L. McConnell, L.P. Heighton, A.M. Sadeghi, A.R. Isensee, J.R. Teasdale, A.A. Abdul-Baki, J.A. Harman-Fetcho, and C.J. Haperman. 2001. Runoff loss of pesticides and soil: a comparison between vegetative mulch and plastic mulch in vegetable production systems. Journal of Environmental Quality 30. 5: 1805-1821. This research has been personally communicated to growers interested in adopting living mulch strategies and suggestions offered based on first year results. A short overview of this research was shared at the Southwest Michigan Vegetable Team tour (Benton Harbor, MI; Aug. 2017). A poster with first year results was presented at the Great Lakes Vegetable and Fruit Expo (Grand Rapids, MI; Dec. 2017). Two oral presentations regarding this work have been given at the Southwest Hort Days (Benton Harbor, MI; Feb. 2018) and at the Great Lakes Vegetable Working Group meeting (Grand Rapids, MI; Feb. 2018).